Please sign a new card. Click here to find out why. PCAs: Please Help MNPCA Help You Out of SEIU! 10,704 PCAs cannot be wrong! It feels like Déjà Vu all over again! You are represented by the Service Employees International Union Healthcare Minnesota (“SEIU”) as a PCA whether you are a dues-paying member or not. If you have dues being deducted, but want that to stop, call MNPCA at the number below and we’ll be happy help. Over the last few years, we have gotten to know one another as we have collected almost 11,000 cards from PCAs just like you, who do not want the SEIU to speak for us and the people we care for, many of whom are family or close friends. All we wanted to do is to get the SEIU to stand for a fair election. We think, if PCAs are given a fair chance, more than half will say no to the idea of a union. It just does not fit the PCA programs. When we got the union back in 2014, most of us had never even heard of the SEIU or any election. In fact, only 13 percent of us got to vote! (Some of us never even got a ballot.) We thought that was just wrong. You know what else is wrong? The SEIU charges union members 3 percent of their gross pay up to $948 a year! And what have they done for us? Here’s where we are: the union and the Dayton administration are saying the 10,704 cards that we worked so hard to collect are “stale.” We are still arguing about that in Ramsey County Court, but we are up against another deadline. If we get enough “fresh” cards from PCAs like you by Thanksgiving time, we can get an election! In that election, you will be asked if you want the SEIU to represent you as a PCA. The reason the cards got stale is that the union and administration would not give us a contact list so we could talk to you, and threw up just about every roadblock you can imagine. But that is all in the past. Hopefully you know about the union this time, and we know how to do this. We just need you to turn in your card ASAP. Why wait? You should be getting a letter from us soon with a card and return envelope. 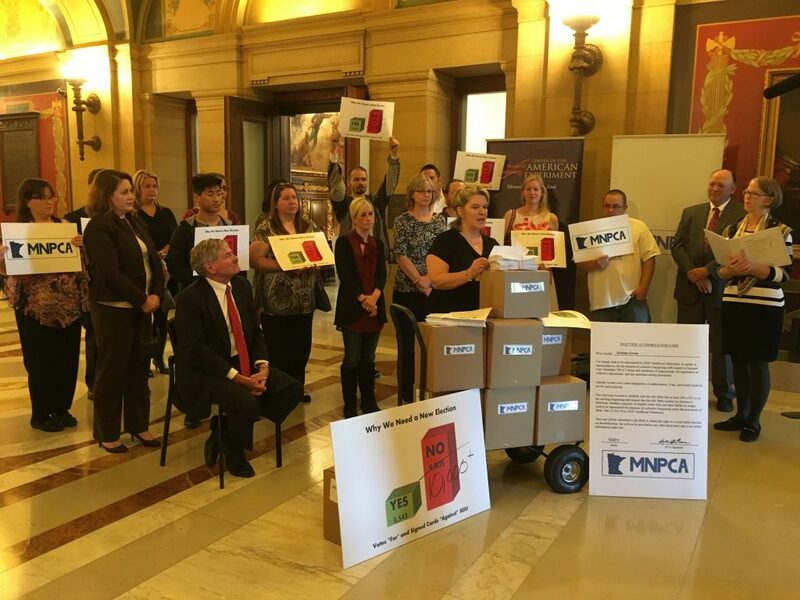 If you do not, you can create a letter on the MNPCA website (or we can help). Would you help us help you? Please complete the card with your full street address. Be sure to sign the card and date it. Then mail the card ASAP, so we can submit all the cards with our petition well before December 2, 2018. You can fill out the card on the website, or if you want us to mail you one, email us at [email protected] or call (612) 460-5457. Remember that the card is confidential by law and only used for the election. No one other than MNPCA’s attorney and the election agency will receive your letter or know that you asked for an election.